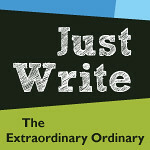 Just Write: The Ordinary Edition. When your life is full of things you want to remember, how do you pick just one thing to write about—one moment to focus on? My brain is bursting with little blasts of color. Tiny pockets of emotion that I hope don’t get swallowed up by time. There’s the image of my daughter holding on to my mom with all her might—lower lip pouting as she prepared to say good bye again. And the tears that I had to choke back as I drove away, wishing with all my might that they didn’t have to go. Then there’s the laughter that filled my morning. A morning that should have been dreary, like the leaden skies that pressed down us. The memory of my daughter racing around and around and around the car, rejoicing in the feel of the fat droplets splashing on her head. The feel of the cold water pooling into my shoes as I stomped stomped STOMPED in a puddle with her, grinning as the rain ruined my hair. And I can’t forget the quiet comfort of an evening spent burrowing into the couch with my husband. Once the toddler was in bed, and the worries of the day were cataloged and put away, I curled up with my head on his shoulder, taking comfort in his steady presence. For a moment, my mind was at peace. A rare thing, indeed. Then, of course, there’s the smell of the IU conservatory stuck in my nose, the humid air rich with the heady scent of growing things and dirt. And the beautiful vision of green fronds pushing up toward the ceiling, transporting us away from our late winter doldrums and into a tropical paradise—if only for a moment. They’re all tiny moments. Just the little events that fill an ordinary week. But I feel better for having written them down. I guess sometimes, I really do have to…just write.